The Election Commission on Monday termed as "exaggerated projection of reality" reports of 'large-scale' failure of EVMs during Lok Sabha and Assembly bypolls in Uttar Pradesh and Maharashtra. New Delhi: Polling was held for bypolls to four Lok Sabha seats and 10 Assembly constituencies spread across 10 states. Besides Kairana in western Uttar Pradesh, bypolls were held in Bhandara-Gondiya and Palghar parliamentary constituencies in Maharashtra and Nagaland Lok Sabha seat. The Assembly bypolls were held in Maharashtra (Palus Kadegaon constituency), Uttar Pradesh (Noorpur), Bihar (Jokihat), Jharkhand (Gomia and Silli), Kerala (Chengannur), Meghalaya (Ampati), Punjab (Shahkot), Uttarakhand (Tharali) and West Bengal (Maheshtala). Over 54 percent polling was recorded in the Kairana Lok Sabha constituency while 61 percent votes were cast in the Noorpur Assembly constituency. The Election Commission has termed as "exaggerated projection of reality" reports of 'large-scale' failure of EVMs during Lok Sabha and Assembly bypolls in Uttar Pradesh and Maharashtra. Amid reports of faulty EVMs from various polling stations, the commission came out with a statement to deny that the failure of the voting machines was unusual. "... The Commission allocates sufficient reserve of EVMs and VVPATs for every general and by election to the Lok Sabha or state Assembly. It is pertinent to mention that during commissioning of EVMs and VVPATs, apart from EVMs and VVPATs required for deployment at every polling station, an adequate number of reserve EVMs and VVPATs (around 20-25 per cent) are prepared to replace any defective machine on poll day at the polling station," it said. It added that the reserve EVMs/VVPATs are kept with sector officers, who replace the defective EVMs/VVPATs. Since each sector officer is entrusted with only 10-12 polling stations, the time taken to replace any EVM/VVPAT is normally less than 30 minutes. "The replacement of defective EVMs/VVPATs during actual polls is a normal process and does not vitiate the integrity or credibility of the poll process in any way whatsoever," the statement read. BJP delegation met EC officials in Delhi over reports of malfunctioning in EVMs during bypolls on Monday. "We told them that we received info that EVMs worked either late or with some issues or didn't work at all in 197 booths, demanded re-polling at few stations," says BJP's Arun Singh. 40.37% voter turnout recorded till 5 pm in Palghar bypolls in Maharashtra. 69% voter turnout recorded till 5 pm in Shahkot Assembly bypolls in Punjab. 70.01% voter turnout recorded till 5 pm in Maheshtala Assembly bypolls in West Bengal. 57% voter turnout recorded till 5 pm in Noorpur Assembly bypolls in UP. 41 per cent voters turnout has been recorded in Bangalore's R R Nagar constituency. While Palghar records 28.22 per cent, Bhandara-Gondia records 31 per cent till 3 pm. Rashtriya Lok Dal (RLD) candidate Tabassum Hasan has written to the Election Commission over faulty EVMs and VVPATs in around 175 pooling booths across Shamli, Kairana and Noorpur. Opposition Samajwadi Party and RLD have complained of snags in EVM machines. "Getting reports of problems in EVMs in the by-election but still voters should go for casting votes), SP president Akhilesh Yadav said in a tweet. SP spokesman Rajendra Chaudhary charged that 140 EVMs have been tampered with in Noorpur and similar reports have also come in from Kairana. "BJP wants to avenge defeat in earlier bypolls in Gorakhpur and Phulpur anyhow and win these by polls," Chaurdhary said. RLD spokesman Anil Dubey said there are reports of EVM malfunctioning in both the constituencies, specially in areas where the RLD-SP have influence. "We (RLD and SP) are going to meet the CEO to lodge a formal complaint in this regard," Dubey said. The BJP meanwhile has demanded that voting time should be extended in the areas where the EVMs are faulty. Around 33 per cent voting was recorded in the Maheshtala Assembly bypoll till 11 am. The polling process began at 7 am and will continue till 6pm. The bypoll was necessitated following the death of sitting MLA Kasturi Das. Maheshtala is witnessing a triangular contest among the Trinamool Congress, the BJP and the Left Front. The TMC has fielded Dulal Das, the husband of the deceased MLA, while the BJP, which is trying to emerge as the main challenger to the TMC, has nominated Sujit Ghosh, a former joint director of the CBI. The Left has fielded Prabhat Chowdhury, a relatively greenhorn in the fray. The Congress is backing Chowdhury. People turned out in large numbers to cast their vote in the morning despite heavy rains. Leader of Opposition in the Kerala state assembly, Ramesh Chennithalawas among the early voters in the constituency. While CPI(M)'s Saji Cheriyan, the party's Alappuzha district secretary, is the candidate of the Left Democratic Front (LDF), Congress leader D Vijayakumar is the United Democratic Front (UDF) nominee. Former BJP president P S Sreedharan Pillai, is testing his luck once again from the constituency. Bharip Bahujan Mahasangh leader and former MP Prakash Ambedkar said around 450 EVMs malfunctioned. Bahujan Vikas Aghadi leader Hitendra Thakur also alleged that "the entire election commission machinery is working on behalf of the BJP in Palghar." Thakur also claimed that there were phone calls from the office of a local BJP functionary in Palghar to housing societies about making arrangements for snacks and refreshments for member-voters. Voting in the Palghar and Bhandara-Gondia Lok Sabha bypolls in Maharashtra was marred by reported malfunctioning of EVMs in some booths. Besides, around 15,000 voters from Mali Ali, Mavanda, Navale and Nandanvan villages in Palghar's Vasai tehsil boycotted polling, citing lack of developmental works in their area. 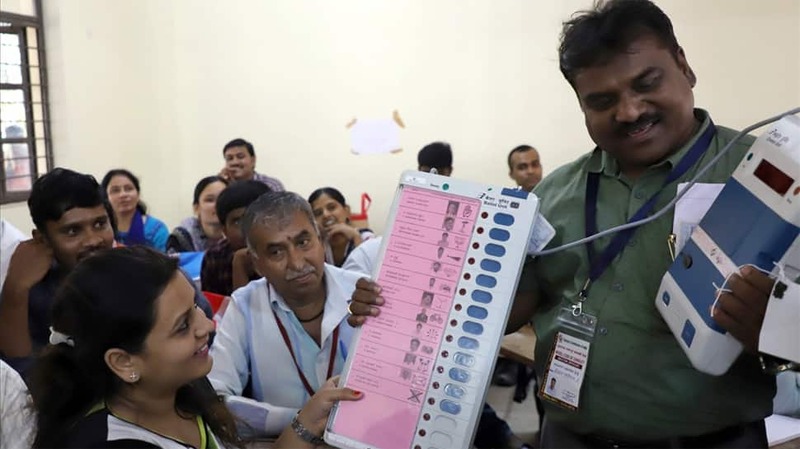 Bhandara–Gondia Lok Sabha by polls: Voting temporarily suspended at 35 polling booths due to faulty Electronic Voting Machines (EVM), says Abhimanyu Kale, District Magistrate. Voting percentage recorded till 11 am - Noorpur: 22%, Shamli: 17%, Kairana: 23%, Thana Bhawan: 24% and Bijnor: 24.55%. Silli seat in Jharkhand fell vacant after sitting MLA Amit Mahto of the JMM, was convicted in a criminal assault case in March. Chengannur seat in Kerala fell vacant after the death of Communist Party of India (Marxist) sitting MLA KK Ramachandran Nair in January. The May 12 polling in Bengaluru's Rajarajeshwarinagar was countermanded following the recovery of alleged fake voter IDs from a flat in Bengaluru. The Election Commission (EC) had then rescheduled it for May 28. A joint opposition is taking on the ruling BJP in Kairana. The constituency fell vacant after the death of BJP MP Hukum Singh, whose daughter Mriganka Singh is now the party's candidate for the bypoll. She is fighting Rashtriya Lok Dal's (RLD) Tabassum Hasan, who is supported by the Congress, Samajwadi Party and the Bahujan Samaj Party.